Nelson Mandela’s autobiography is a fascinating read of a great man’s life. To adapt such a sprawling and heavily detailed document into film is an almost impossible task, yet director Justin Chadwick and screenwriter William Nicholson have done an admirable job. 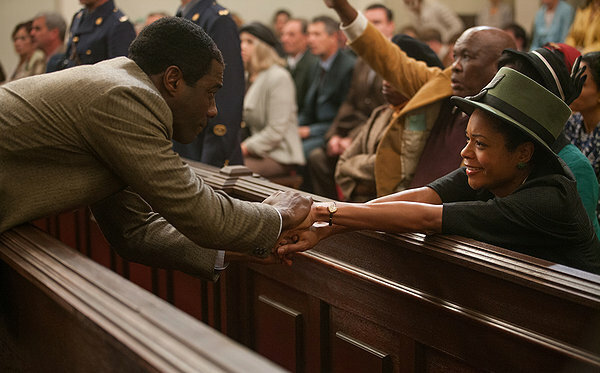 On reflection, considering the enormity of the source material, the adaptation of Mandela: Long Walk To Freedom is as good as it could get, and even though there will be those who may complain that too much has been omitted, what we have left is still a remarkable piece of work. The problem with any film based on a life is that we can only see the highlights. 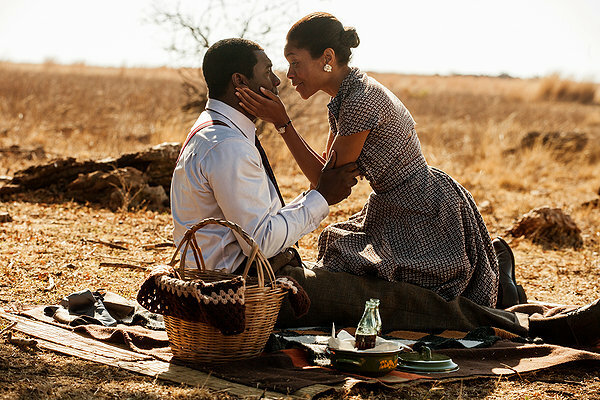 Naturally there will be jumps in narrative, or perhaps events of which we are aware might be absent altogether, but the essence of what made Mandela South Africa’s eventual leader – inspirationally and literally – is intact and what brings that alive is a truly sensational performance from Idris Elba. 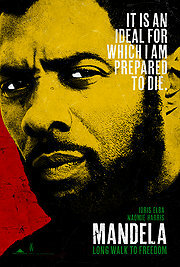 “I dream the same dream, night after night” Elba’s Mandela tells us in a melancholic voice-over. It’s of the people he knew and loved, the people of his life. It will be more than two hours later until we hear the concluding statement. “I still dream the dream,” he states as the film draws near its conclusion. “I want to touch them, but they’re all gone.” What happens in between is the story a man nicknamed Troublemaker as a child who went on to become a lawyer, imprisoned for twenty-eight years on Robben Island under horrendous conditions, and eventually became the South African president in 1994. With a scope that sweeps so broadly over such a long period there are bound to be omissions, but the strength of the film is that the moments we have presented are so riveting and well performed we should forgive the omissions and savor what is there. An early example of white prejudice comes when we see Mandela as a lawyer defending a frightened black woman against the accusations of her white employer who claims her maid stole some of her clothes and underwear. When Mandela tries to question the white woman, the accuser can’t accept that a black man could even talk to her let alone ask her pointed questions. She refuses to reply. The fact that the woman was really a hostile witness and such actions would ordinarily result with contempt of court was not an issue. The woman was white, the judge was white, and apartheid was the rule of the day. The judge had no further option but to reluctantly dismiss the case. 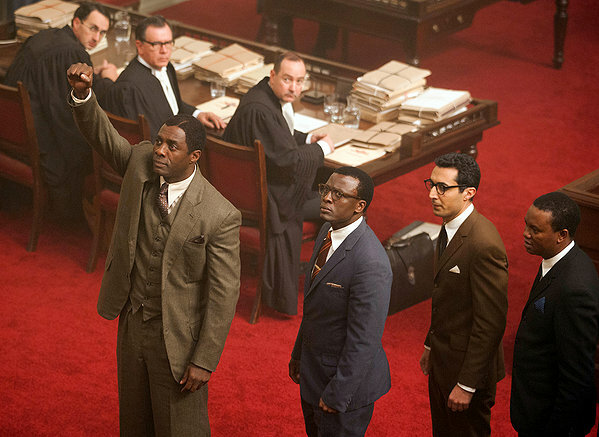 Even though Idris Elba is of a considerably different stature to the real Nelson Mandela, it is still Mandela we see. Despite his size, as Elba’s characterization grows older, he takes on the look of the man with whom most of us are now familiar; the graying of the hair, the circles around the eyes, the husky, heavily accented sound of his voice, it’s all there, and it’s Mandela we see, a testament to the enormity of Elba’s well-rounded performance. But there are others. When negotiating with white leaders of the country, Mandela calmly tells them, “You’ve always been afraid of us and it has made you a brutal and unjust people.” It’s the quiet truths that Mandela states that shouts louder than any rousing speech, and Idris Elba is thoroughly convincing.